FlamesRising.com is pleased to present you with another exciting fiction preview for the dark fantasy novel DARK KNOWLEDGE. Written by Keith Pyeatt, this dark fantasy e-book is about a struggle between good and evil. When good and evil intertwine, taking one means accepting the other. Read the first chapter in this new paranormal thriller from Keith Pyeatt. The memory played again. This time he recognized his mother’s words, heard her whispering voice, saw her sad eyes close. Then the meaning of her words became clear. The racing particles inside him gained weight and jagged edges. They tore at his insides. Wesley tried to purge the memory, but it was part of him now. He tried to ignore the meaning, but there were no other thoughts to distract him, no comforting memories to soften the impact. The first clear realization of Wesley’s life wasn’t a prize at all. It was poison. The fog parted to expose four statuesque objects. Haze obscured their details, but their color bled through, tinting the wisps of clinging fog emerald green–the bad color. He needed to leave. His mother had told him many times to run from the bad color, but a sudden warm breeze stirred and lifted the fog, revealing more towering thoughts. The landscape of his mind became a downtown skyline of brightly colored buildings with smooth, irregular surfaces. Wesley couldn’t remember seeing the structures before, yet he recognized them and for the first time knew why he’d come here. They belonged to him. They were the promise he felt in the fog. Fresh excitement dwarfed his pain and fear. Then the colors paled. The world lost detail. Wesley tried to refocus, afraid of losing a chance he might never again be offered. It was no use. Even the thought that had revealed its meaning became a ghost. He tried to remember its message–something about his mother–but it was already lost. Emerald light overwhelmed everything then faded, taking a world of promise with it, but leaving a friend in its place. “You having a bad moment, Wes?” Bobby asked. Wesley opened his eyes, but he stared straight ahead at a wall, confirming Bobby’s suspicion. Wesley was zoned out, in another of his trances, the fourth since Bobby first noticed them a week ago. Bobby rested his hand on Wesley’s right shoulder, barely touching him. Like most residents at Brookside Group Home for the Mentally Challenged, Wesley responded well to physical contact, but a preoccupied resident was easily jarred. Bobby made his presence known a little at a time, first by adding weight to his touch, then gently squeezing. Wesley blinked twice. He turned his head and gazed at Bobby with cloudy green eyes. “Hi, Bobby.” His speech was slurred, unusual for Wesley. He used the back of his hand to wipe his lips. Wesley nodded vigorously. His eyes cleared. Wesley’s grin widened, broke open, and stretched into his goofy smile. It infected Bobby’s face, making him return a smile despite his concern. He sat on the couch opposite Wesley’s chair, and the cushion crinkled under his weight. Thick, clear tape covered the roadmap of cracks in the yellow vinyl. This was new. A ripping noise across the room drew Bobby’s attention. Henry Barton, owner of Brookside, bent over a vinyl chair and smoothed a strip of tape over the seat cushion. He waited for Wesley to recognize the prompt. Wesley’s recent fascination with jobs, with the idea that Bobby and the other aides were at work when at Brookside, had him studying the aides’ conversations. Bobby had taught Wesley what to say to any mention of a raise. Wesley grumbled, imitating the aides when their breaks ended, but his eagerness shone through. He quickly gave up posturing and sprang to his feet. With no other aides around and a good line still on his lips, Bobby decided to tease Henry as they passed. Wesley wouldn’t mind the repetition. “You must have decided to give me a raise instead of buying new furniture. Good choice.” Bobby carefully used the tone of voice Wesley would recognize as a joke. Wesley liked being included, whether he understood the joke or not. “I’d live within your current means if I were you,” Henry said. He stepped back to examine his work and frowned. “We need new furniture. Nice try, though.” He winked at Wesley. Wesley’s smile cracked open, and he released a single “huh” of laughter. “Worth a shot,” Bobby said, nudging Wesley. Wesley returned the nudge. “Sure,” Bobby said. He and Wesley headed down the hall. The closer they came to the training room, the faster Wesley walked. His eagerness made the extra work of preparing him for a job worthwhile. Wesley would soon be a volunteer at the Goodwill used clothing store. Bobby hoped the job would build Wesley’s sense of purpose and pride, especially since he was so preoccupied with the concept of work lately. As always, Bobby had prepared the training room before getting Wesley. Clothes lay scattered across tables and overflowed cardboard boxes. Wesley stood in the doorway and surveyed the room. “Looks like a lot of work for you today.” Bobby waited for the reaction Wesley gave every day. Wesley clucked his tongue. He entered the room, looked carefully around him, and behaved exactly as Bobby had taught him. He cleaned his usual spot on his usual table and began gathering strewn clothes. He would fold and sort by function: shirt, pants, sweaters and coats, socks, gloves. Then he would spread the clothes out on the display tables and begin emptying the cardboard boxes. He seemed focused now, but Bobby couldn’t stop thinking about the trances and wondering what caused them. Stress? Stress over this job training? Wesley tossed a folded woman’s blouse onto a pile and looked up for Bobby’s approval. At just over six feet tall, with broad shoulders, a thick neck, and ten pounds of extra weight around the middle, Wesley looked like an athlete a half dozen years past his prime. His short brown hair had receded, but the exposed forehead only served to emphasize masculine facial features that belonged in a machine shop or garage. Not here. “Okay.” Wesley gave Bobby a quick smile and began folding a man’s red cardigan. Bobby found his boss seated behind his desk. Bobby listened to Henry’s end of the conversation closely enough to learn Brookside was getting a new resident, but most of his attention remained on eight-year-old memories of meeting Wesley. And Lydia. She had arrived unannounced with Wesley in tow. This was back in 1988, only three months after Brookside first opened in a cinder block building in downtown Roanoke, near the old train tracks. Bobby had been nineteen, and it was his second week on the job. Henry was across town lining up services for the new facility, so as unqualified as Bobby felt about explaining Brookside’s group home philosophy to a potential client, he took a deep breath and began. Lydia waved him silent. “Save the sales pitch,” she said. “I don’t need it. Most mothers are rid of their sons after eighteen years. This one’s twenty-two. He’s yours now.” She shoved Wesley, pushing the center of his back with her extended fingertips. Wesley stumbled forward a step. He looked lost and completely helpless. Lydia spun and sashayed out the door. Bobby chased after her, trying to sound calm as he explained she couldn’t simply drop off her son and leave. Lydia never so much as glanced at Bobby as she drove away. Wondering how Henry would react to this situation, Bobby returned to the lobby and found Wesley staring out the window into the empty parking lot. He mouthed something–it could have been “come back”–before clouds moved over his eyes, hiding anything that might be awake behind them. Henry eventually tracked Lydia down and worked things out between her and the state. Wesley was admitted, but it would be a year before Bobby could coax a word out of him, three years before Wesley began routinely interacting with other residents. Now Wesley was far more advanced than anyone imagined eight years ago. Instead of sullen, he was cheerful and animated, freely sharing his highly contagious goofy smile. Bobby still wondered what had suppressed that wonderful smile. What slowed Wesley’s development all those years? Although Bobby still questioned what had been done to Wesley, he remained certain who had done it: Lydia. Nasty was the right word, but Bobby also remembered a strange, sensual quality when he first saw her. That impression ended the moment she spoke. Her mouth was a weapon. Her lips were mean, living gashes in her face. They sometimes rippled before she spoke as if she tasted each phrase before shooting it from her mouth with deadly accuracy. “It’s not right,” Bobby said, suddenly aware of the bottom of his stomach. Lydia’s departure was Bobby’s strongest memory of her. Henry, Bobby, and Lydia had met in the tiny, windowless conference room in the old building. A battered oak table filled most of the room. Lydia sat alone on the side of the table by the door. Henry and Bobby sat across from her. Henry signed his name to the admittance papers, slid them across the table, and encouraged Lydia to read them before signing. After a moment of defiant hesitation, she signed the unread documents and shoved them back. Bobby signed as witness. Lydia stood and declined an offer to see Wesley before she left. She huffed at the open invitation to visit her son whenever she liked and took a long drag on a cigarette. After exhaling a stream of smoke that mixed with the haze floating above the table, she dropped the cigarette onto the tile floor and crushed it under a scuffed patent-leather shoe. 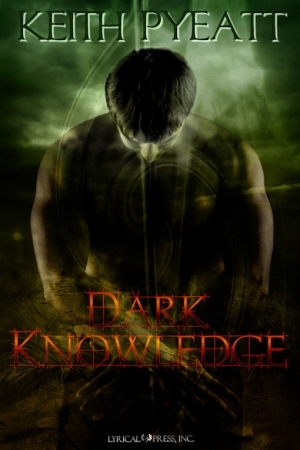 Dark Knowledge is available now at DriveThruHorror.com. This preview for was provided and published with express permission from Keith Pyeatt. ©Copyright 2009. All rights reserved. I tried to leave a message yesterday, but i wouldn’t let me. Kept saying there was an error. Glad I tried again tonight. Keith, this chapter is chilling. Just as I remembered, but even more so. Best of luck with your promos and sales. Thanks, Joylene. And I appreciate the good wishes.